Several Donbass Battalion members guarded perimeter of the Velyka Novosilka police station while others raided building. To prove his point, another gestures to a rusty metal pipe with a hastily welded handle resting at his feet. “That’s a Ukrainian bazooka. Light a match, and boom!” he explains. In the dusty courtyard of a rickety agricultural factory in this bucolic eastern Ukrainian town of less than 40,000 people, some 30 members of the Donbass Battalion, a pro-Kiev militia unit created to fight Kremlin-backed separatists who have besieged the country’s eastern regions, is readying to storm police headquarters and city hall in Velyka Novosilka. Days before, separatists removed the town’s Kiev-appointed mayor from his office, seizing control of the city-council building, and raising the red, black and blue separatist flag of the so-called Donetsk People’s Republic, as police stood idly by. 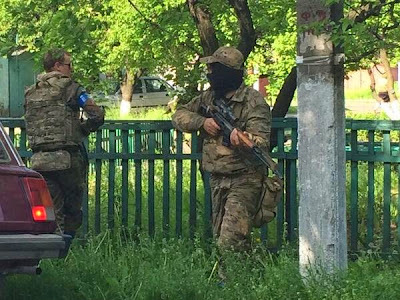 On May 15, the ragtag militia group reinstalled Alexander Alexandrovich Arikh, a 29-year-old lawyer, as mayor, took down the self-proclaimed republic’s flag and hoist the blue-and-yellow Ukrainian flag. In final preparations before the mission, battalion members — donning full combat gear — went over logistics, as they filled their pockets with zip ties and grenades, and double- and triple-check magazines before clicking them into their automatic rifles. Squeezed into ramshackle Soviet-era vehicles, they motored swiftly in a column over cratered roads toward the police station. There, they leaped from the cars and rush the building, shattering its windows with the butts of their rifles and kicking in the doors, as they ordered 10 trembling policemen at gunpoint to drop to the ground. After disarming them and proselytizing to them their ideas on loyalty and duty to country, the group moved on to the city council building, where they raised the Ukrainian flag. In all, the mission lasted no more than 20 minutes, and was done without firing a shot. With military counter-terrorism operations launched weeks ago to seize back control of Donetsk and Luhansk regions from the grip of armed pro-Russia militants proving largely unsuccessful, Ukrainians are taking matters into their own hands, forming loosely organized militias. “They have the authority, the guns. But they flee from armed -– and unarmed -– traitors,” he explains. On several occasions, Ukraine’s armed forces, faced with mild resistance, have simply turned over their weapons and armored personnel carriers to pro-Russian fighters and even unarmed separatists. Perhaps with that in mind, Ukrainian authorities tacitly back the irregular groups, while high-profile oligarchs directly support at least two of them. In recent weeks, the units have destroyed pro-Russian militants’ checkpoints, freed several occupied buildings, captured several militants and seized their weapons. But pro-Russian separatists also have several of their own militias, including the Vostok Battalion, which operates in Donetsk and mans checkpoints throughout the region, as well as Russian Cossacks with close ties to Russian intelligence agencies, which have popped up in the flashpoint cities of Slaviansk and Kramatorsk. The latter has clashed with Ukrainian armed forces on several occasions, killing more than 20 servicemen, and wounding dozens more. Several within their own ranks have also been killed. The militias on both sides of the fight have rushed in recent weeks to arm themselves –- the pro-Russian side has stormed police stations and looted hunting shops to acquire arms, while it’s unclear exactly where the pro-Ukraine unit obtained theirs. Serhey Yeremin, Donbass Battalion’s deputy commander, declines to tell Mashable how his militia came into dozens of automatic rifles. “No comment,” he chuckles in heavily accented English. “It’s a very alarming development,” he tells Mashable by phone from Moscow. That’s extremely worrying, considering most of the men on both sides have little combat experience, and have undergone limited training. It means “the chances for bad things to happen… get that much greater,” Galeotti says. Semenchenko says his men come from different regions of the country, and have varying backgrounds, but insists all have some type of military experience. The militiamen undergo about 50 hours of training before they are “battle ready,” he explains in the forested courtyard of a children’s summer camp 100 km west of Donetsk in Dnipropetrovsk region, where his unit has set up shop, and conducts training drills. All are unpaid volunteers who signed up to “defend the motherland,” he adds. More than 100 militiamen have joined the group, while more than 600 are on a waiting list. Many members have invested their savings into the battalion, but some money is raised through crowdfunding online. Semenchenko himself is active on Facebook, where he pleads with “patriots” to donate to the cause by wiring money to a bank account listed there. As 10 of his men take part in target practice in a small wooded gully not far from their barracks, Semenchenko insists that militia groups are necessary now to fight separatism, due to the Ukrainian military’s “cowardly” actions. For two members, target practice one day before the Velyka Novosilka operation is their first time shooting a Kalashnikov rifle. One is a middle-aged medic who tended to Euromaidan protesters in Kiev during the revolution that ousted former Ukrainian president Viktor Yanukovych in February. While the Velyka Novosilika operation was carried out without any hitches, those of other groups have ended in bloodshed. In an incident last weekend, as separatists opened polls to vote in an illegal referendum on secession, another pro-Ukraine militia group stormed a city-hall building in the town of Krasnoarmeisk to stop people from casting ballots. Witnesses say the militia was a volunteer battalion called Dnipro. The unit is based in neighboring Dnipropetrovsk region, and funded by the region’s Kiev-appointed governor and oligarch Ihor Kolomoisky. As rowdy separatists swarmed the entrance to the building that day, the militia group — wearing assorted and unmarked uniforms, fired several warning shots into the air, in a display of unprofessional conduct. Amid the gunfire, one man grabbed the barrel of a militiaman’s automatic rifle. In response, the militiaman fired into the pavement, with a bullet apparently ricocheting and hitting the civilian in the leg. As gunfire continued to ring out, at least one man was shot in the back, and killed. Reports say two men died in the incident. The Dnipro Battalion denies being in Krasnoarmeisk that day, and in a statement posted to its website, Ukraine’s Interior Ministry says the battalion had “never left Dnipropetrovsk region,” raising questions as to who exactly the group was. Nevertheless, it appeared to be a volunteer unit. The ministry opened an investigation into the event. “Partisan warfare is what you do when you can’t do anything else,” Galeotti says. “There comes a point when partisan forces have to convert themselves into regular military forces. One thing that worries me that it contain to many personal descriptions of the fighting commanders and detailed references to the location of their training grounds.